A while ago we talked about ways to develop a child’s fine motor skills, and today we’re moving onto the larger body muscles. Gross motor skills are all about using physical exercise to help a child gain control of body parts like the arms and legs right down to hands and toes. Play with balloons and shout out different body parts that the little ones must use to keep it in the air. Dust off the hula hoop and let the kiddos hula-hula, crawl through the hoop and use it as a “jump rope”. Indulge in good ol’ fun-fair games like egg races, three-legged races and bunny-hopping. Create a simple kiddie-friendly version of charades (using picture cards instead of words) where they have to act out things like “cat”, “sad dog” and “sleeping bird”. Sing songs that require bodily movement, whether it be crazy dancing or following instructions like “head, shoulders, knees and toes”. Classic children’s games like “what time is it Mr Fox”, Ring-a-Ring-a-Rosie, Hopscotch, Simon Says and Follow the Leader not only enhance gross motor skills, but encourage them to socialize with other kids. Mix and match a variety of basic ball games – from ten-pin-bowling to soccer and pool volleyball. 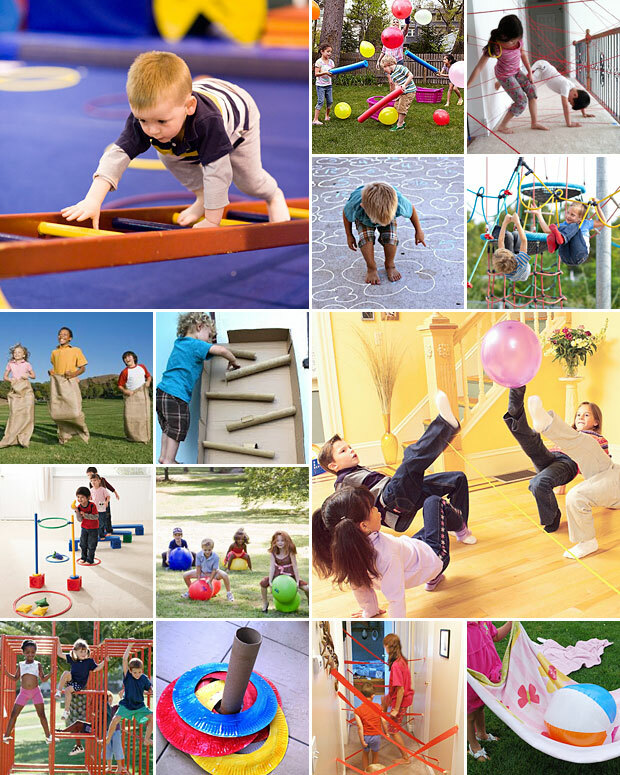 Turn the living room or backyard into a full-blown obstacle course, using trees, pillows, boxes and playground toys as part of the course.